Note : Free entry for kids below 3 feets height. DANCE DANDIYA NIGHT season 2 is here with all new energy, thrill, excitement, enjoyment and colours of Navratri. Come to Gardens Galleria & groove on Dandiya tracks with Bollywood singer and our own Delhi girl Shibani Kashyap. 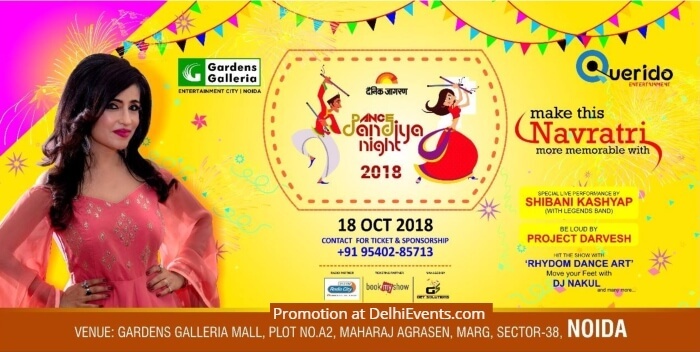 So choose your colourful attire and wooden Dandiya sticks to groove & book your tickets now to be part of Delhi NCR's biggest Dandiya Night with Shibani Kashyap, Project Darvesh, Rhydom Dance Art & DJ Nakul. Be ready with your Dandiya moves to groove on the latest beats of the season and enjoy Lip Smacking Food, Lucky Draw, Dandiya Garba Raas, Shopping, Games and lot of entertaining stuff like Tattoo Art, Mehendi etc.